Surrounded by friends and family today feeling overwhelmed with emotions both good and bad, cherishing every second with so many wonderful people yet missing the one person who always completed me. I’m not done grieving, not by a long shot. Standing talking to one of my best friends one second and overcome with emotions the next, like a tsunami taking me out to sea in a wave I never expect and can’t ever begin to forecast. What brings this wave to my shores can be anything; a song, watching other people with their spouse, my kids running to someone else’s dad/husband for comfort, or the overwhelming feeling of loneliness only a widow gets in a group of people who love her. You see, it really does not matter how many people love you, hold you, embrace you, you are still missing *him* nothing else makes that better, and it is a process that as a widow you learn to live with, deal with, cope with. So many people think death and grief are a process and at the end of the process you are healed, you are whole again, you are okay. If I’m being honest, I don’t really think I will ever be healed, but I will be okay, I will make it through, I will survive. If you ask my closest friends, I am a MASTER at hiding these grief moments, not because I don’t want to share my pain, or am trying to hide my pain, but because my pain is very private and personal to me. I think at times because I don’t show my pain publicly people make assumptions about where I am in my process or about my relationship with my husband. Never make assumptions about a widow, we all do this in our own way and as I have said before, no way is right or wrong – it just is what it is. My pain at 13 1/2 months is still raw, it still takes my breath away, it still stabs me a thousand times each day, it still takes me out to sea with no view of a shore. Yet, I am thankful. I don’t even know where to begin to explain how thankful I am in my life. I’m thankful for every single second I ever shared with Mitch, I’m thankful for 2 amazing healthy kids who drive me nuts and wear me out but surround me with more love then I should ever be blessed to have. I am thankful for my wonderful family, my amazing and beautiful friends, my health, my fitness, my perspective on life, my view of this world. 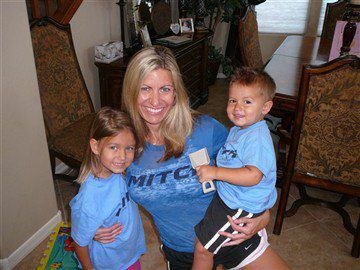 Before Mitch passed, I was not always so thankful and I often took things for granted, including him. I worried so much about what was next and what more could we have. I often wasted time thinking about mistakes made in the past or stressing about who had what and why we didn’t. I’m not proud of those emotions but if we don’t understand where we have been, we can’t move forward, we can’t make positive change. Tonight, above all other things I am thankful that Mitch was brought into my life to teach me how to be content and how to live in the moment. Without that life lesson I would not be able to look at my kids each day and feel the joy in the chaos. Without that life lesson I would have never been able to walk away from my corporate job to do something I feel passionately about. Without that life lesson I would still look at monetary possessions as if they really make life better. Without that life lesson, the years left in my life might not be filled with the same level of love and peace that I have with me now. Find some measure of happiness in every aspect of your life. It may not be perfect, but it is your life and happiness ultimately is yours to find. Each day, look for a little peace, find a reason to smile, realize you have more than someone else, and thank those in your life who make the ride worth taking.